Volume 1 | Issue 1 | Apr – June 2016 | Page 10-14|Kunal Shah, Manish Kothari, Abhay Nene. Mumbai Central, Mumbai. India – 400008. Surgical management of degenerative scoliosis has no established guidelines. The options available range from decompression alone, decompression with limited fusion or decompression with global fusion. Major factors influencing the type of surgery are symptomatology, spinal deformity, and general condition of patient and local factors in spine. Selection of surgical option and also outcome of surgical options depend on radiological and clinical factors. Radiological factors affecting surgery are magnitude of curve, apical vertebra rotation or subluxation and sagittal imbalance. Clinical factors affecting outcome of surgery are amount of back pain compared to leg pain, patient willing to take risk of fusion surgery later, patient understanding of residual back pain, complications of surgery and general condition to cope with the surgery. Therefore a balance between benefits of surgery and complications should be evaluated before choosing the type of surgery. In this article we share our experience with literature review in management of such complex situations. Keywords: Adult degenrative scoliosis, decision making, management. The type of surgery to be performed in degenerative scoliosis is always been controversial. There is no general consensus on one type of surgery better than other. The goal of surgery is to relieve the leg pain/back pain and correct sagittal/coronal imbalance. The surgery can range from decompression alone, decompression with limited fusion or decompression with global fusion. The decision of type of surgery should be taken with all considerations based on clinical profile of patients, amount of restriction daily activities, general condition of patient and expectation out of surgery, so as to choose the most suitable surgery under given circumstances. Major factors influencing the type of surgery are symptomatology, spinal deformity, and general condition of patient and local factors in spine. Degenerative scoliosis is usually seen in elderly .Therefore general condition of patient in view of medical complications and co morbidities should be evaluated . In frail elderly, operative time, amount of blood loss and extent of surgery should be considered to prevent perioperative morbidity. Minimal short time surgery is preferred in elderly frail patients. In degenerative scoliosis, the curves are stiffer and require extensive surgery for correction as compared to adolescent scoliosis. Surgery for coronal plane deformity is indicated in unbalanced curves, progression of curve and large curves and rarely for cosmetic reasons . However associated sagittal plane deformity can also cause symptoms of back pain and leg pain. Inability to restore sagittal balance leads to poor surgical outcome. Sagittal decompensation due to inadequate correction can be associated with higher pelvic incidence and pelvic tilt. Therefore lumbar lordosis should be corrected in proportion to the pelvic incidence. Inadequate correction of lumbar lordosis is also seen with loss of correction of disc spaces after posterior instrumentation. Anterior column reconstruction prevents loss of correction of disc spaces and gives better restoration of lumbar lordosis . Therefore the type of surgery should also aim at restoring sagittal balance. Decompression alone is indicated when primary complaints is radiculopathy/claudication with minimal or no back pain. Radiographically these are typically smaller curves without any instability. This approach gives dramatic pain relief in leg symptoms and improves walking distance . The concerns with decompression alone are possibility of further progression of deformity or iatrogenic spinal instability . It serves as a good option in elderly patients who cannot tolerate fusion surgery. Liu et al  in a study of 112 patients operated for degenerative scoliosis concluded that the patients operated with decompression alone gives satisfactory results and type of surgery should be based on patient’s age, general and economic factors, severity of deformity and other coexisting lumbar degenerative disorders. Hosogane et al  concluded that average curve progression was 3.4 degree in mean follow up of 2.8 years in patients operated with decompression alone. In only 21.6 % patients the curve progressed to more than 5 degrees. This progression was similar to curve progression in natural history of degenerative scoliosis. Curve progression after decompression surgery alone could not be predicted in preoperative period. They concluded that fusion surgery is not always advocated to prevent curve progression when the main symptoms of patients are due to nerve compression. Matsumura et al  studied results of microscopic bilateral decompression via a unilateral approach (MBDU) in degenerative lumbar scoliosis. They concluded that MBDU reduces postoperative segmental instability and achieve satisfactory clinical outcome, convex approach gives good visibility of neural structures and facet joint. Figure 1 shows a 67 year old lady with multiple co morbidities and osteoporosis, complaining of severe neurogenic claudication with no back pain. Radiograph showed degenerative scoliosis and a stable spondylolisthesis at L45 level. MRI was suggestive of significant L45 level compression. Her daily functional demands were less .She was operated with decompression at L4-5 level. Decompression with limited fusion is usually indicated in cases having single level instability or to prevent iatrogenic instability in the decompressed area. It is a good option in moderate curve with segmental instability. The concerns with limited fusion are adjacent segment disease which is commonly seen. If the fusion stops at the apex of deformity, then deformity might increase . Figure 2 shows a case of 60 year old lady with significant back pain and localized nerve symptoms; radiograph showed a degenerative scoliosis with Cobb angle of 35 degrees and L4-5 instability with significant localized compression on MRI. She was operated with decompression with L4-5 fusion. Decompression with global fusion is indicated when there is large curve and apical vertebra subluxation. The symptoms are disabling with significant back pain with leg pain. Posterior instrumentation gives good coronal correction but poor sagittal correction. Adequate restoration of sagittal balance requires anterior column support or vertebral osteotomy procedures [5, 13, 14]. Anterior alone surgery has advantages of enhanced fusion rates due to large surface area, better global curve correction and preservation of posterior musculature. However it is associated with high complication rates and morbidity especially in elderly. Combined anterior and posterior surgery is associated with better curve correction, higher fusion rates and better restoration of sagittal and coronal imbalance. However it is associated with increase in operative time, more blood loss and morbidity [15, 16,17]. Crandall and Revella  compared results of anterior interbody fusion versus posterior interbody fusion in treatment of degenerative scoliosis. They found no significant difference in clinical outcomes or complication rates. Surgical correction of sagittal deformity is described using various osteotomy procedures like Smith –Peterson osteotomy, pedicle subtraction osteotomy and vertebral column resection. When deciding on the osteotomies, advantages should be weighed against the morbidity . Cho et al  in a comparative study between short fusion versus long fusion in degenerative scoliosis concluded that long fusion gave better correction of scoliotic curve, coronal imbalance and rotational subluxation of apical vertebra as compared to short fusion. However sagittal balance and lumbar lordosis was inadequately corrected. Figure 3 shows a 58 year old lady with significant back pain and leg pain, radiographs shows degenerative scoliosis with Cobb angle of 45 degrees, L4 vertebra (apical vertebra) subluxated with sagittal instability. She was operated with decompression at L45 with posterior global correction. General guidelines for fusion should be followed to prevent complications [19,20]. 1) These are the fusion should not stop at apex or at spondylolisthesis. 4) Laterally translated vertebra or level of rotatoy subluxation should be included in fixation. 5) Usually the upper instrumented vertebra should be the most horizontal vertebra. The proximal extent of fusion is debatable and there is controversy whether the fusion should stop at lumbar level, T11/T12 or T10. Fusion stopping at L1 can cause adjacent segment disease due to high stresses in proximal junction area. Therefore it is recommended to fuse above. Some authors suggest that it does not prevent adjacent segment disease (ASD) because ASD is a part of degenerative process . Extension of fusion upto T10 as against stopping at T11/T12 is favored since T10 is more stable due to true rib attachment. Fusion upto T10 is associated with high perioperative complications due to extensive surgery. Some authors suggest that T11/T12 level is acceptable if the upper instrumented vertebra is above upper end vertebra . Fusion upto sacrum is recommended when L5-S1 segment has some pre-existing pathology. Controversy arises when L5-S1 segment is healthy . Advantages of fusion upto sacrum are better correction of sagittal imbalance and no chances of subsequent degeneration. Disadvantages of fusion upto sacrum are it’s a relatively morbid procedure and high chances of pseudoarthrosis which can require subsequent extension of fusion upto ilium. Advantages of fusion upto L5 are that it is relatively less morbid and normal L5-S1 segment is spared. Disadvantage is that L5-S1 segment is prone to degeneration (ASD) [24,25]. Early complications include pulmonary embolism, respiratory distress, epidural hematoma, transient neurologic deficit and infection. Risk factors for perioperative complications increase with longer operative time, excess blood loss, associated medical comorbidities and medications taken prior to surgery (ecosprin or clopidogrel).This can be prevented by optimizing patient well and shorter duration surgery with less blood loss [26,27]. Cho et al concluded that longer fusion group is associated higher rate of early complications . ASD presents as adjacent level stenosis and proximal junctional kyphosis. ASD can be caused due to facet joint violation, inadequate restoration of sagittal balance, stopping at junctional level (L1 or L5) and not including adjacent spondylolisthesis or apex in fixation[28,29]. ASD is common in short fusion group. ASD can be prevented by restoring sagittal balance and including high stress segments into fixation. Pseudoarthrosis is usually occurs at T12-L1 and L5-S1 junction. Risk factors for pseudoarthrosis are inadequate restoration of lumbar lordosis, osteoporosis and thoracolumbar kyphosis more than 20 degrees . It can be prevented by including junctional area in fixation, restoring lumbar lordosis, creating larger surface area for fusion by anterior column grafting and use of artificial bone grafts or allografts. Instrumentation failure usually presents as screw loosening and screw pullout either at proximal or distal end. Risk factors for instrumentation failure are inadequate fixation, osteoporosis and inadequate sagittal balance restoration especially in long fixations [31,32]. This can be prevented by extending fusion upto ilium or using cemented screws. Management of degenerative scoliosis is one of the most challenging issues in spine care and requires complex decision making in terms of treatment options and outcomes. Type of surgery depends on various radiological factors and clinical factors. Radiological factors affecting surgery are magnitude of curve, apical vertebra rotation or subluxation and sagittal imbalance. Clinical factors affecting surgery are amount of back pain compared to leg pain, patient willing to take risk of fusion surgery later, patient understanding of residual back pain, complications of surgery and general condition to cope with the surgery. Therefore a balance between benefits of surgery and complications should be evaluated before choosing the type of surgery. 1. Glassman SD, Bridwell K, Dimar JR, Horton W, Berven S, Schwab F. The impact of positive sagittal balance in adult spinal deformity. Spine (Phila Pa 1976) 2005;30:2024-9. 2. Palmisani M, Dema E, Cervellati S. Surgical treatment of adult degenerative scoliosis. Eur Spine J. 2013 Nov;22 Suppl 6:S829-33. 3. Simmons ED. Surgical treatment of patients with lumbar spinal stenosis with associated scoliosis. Clin Orthop Relat Res 2001;(384):45-53. 4. Cho KJ, Kim YT, Shin SH, Suk SI. Surgical treatment of adult degenerative scoliosis. Asian Spine J. 2014 Jun;8(3):371-81. 5. Cho KJ, Suk SI, Park SR, Kim JH, Kim SS, Lee TJ, Lee JJ, Lee JM. Short fusion versus long fusion for degenerative lumbar scoliosis. Eur Spine J. 2008 May;17(5):650-6. 6. Palmisani M, Dema E, Cervellati S. Surgical treatment of adult degenerative scoliosis. European Spine Journal. 2013;22(Suppl 6):829-833. 7. Cho KJ, Kim KT, Kim WJ, et al. Pedicle subtraction osteotomy in elderly patients with degenerative sagittal imbalance. Spine (Phila Pa 1976) 2013;38:E1561-6. 8. Youssef JA, Orndorff DO, Patty CA, Scott MA, Price HL, Hamlin LF, Williams TL, Uribe JS, Deviren V. Current status of adult spinal deformity. Global Spine J. 2013 Mar;3(1):51-62. 9. Vaccaro AR, Ball ST. Indications for instrumentation in degenerative lumbar spinal disorders. Orthopedics 2000;23:260-71. 10. Liu W, Chen XS, Jia LS, Song DW. The clinical features and surgical treatment of degenerative lumbar scoliosis: a review of 112 patients. Orthop Surg. 2009 Aug;1(3):176-83. 11. Hosogane N, Watanabe K, Kono H, Saito M, Toyama Y, Matsumoto M. Curve progression after decompression surgery in patients with mild degenerative scoliosis. J Neurosurg Spine. 2013 Apr;18(4):321-6. 12. Matsumura A, Namikawa T, Terai H, Tsujio T, Suzuki A, Dozono S, Yasuda H, Nakamura H. The influence of approach side on facet preservation in microscopic bilateral decompression via a unilateral approach for degenerative lumbar scoliosis. Clinical article. J Neurosurg Spine. 2010 Dec;13(6):758-65. 13. Bradford DS, Tribus CB. 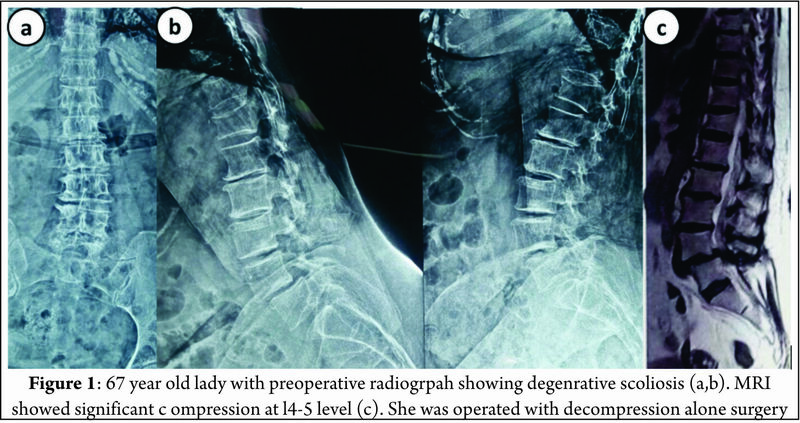 Vertebral column resection for the treatment of rigid coronal decompensation. Spine (Phila Pa 1976) 1997;22:1590-9. 14. Daffner SD, Vaccaro AR. Adult degenerative lumbar scoliosis. Am J Orthop (Belle Mead NJ) 2003;32:77- 82. 19. Aebi M. The adult scoliosis. Eur Spine J 2005;14:925- 48. 20. Gupta MC. Degenerative scoliosis. Options for surgical management. Orthop Clin North Am 2003;34:269-79. 21. Shufflebarger H, Suk SI, Mardjetko S. Debate: determining the upper instrumented vertebra in the management of adult degenerative scoliosis: stopping at T10 versus L1. Spine (Phila Pa 1976) 2006;31(19 Suppl):S185-94. 22. Cho KJ, Suk SI, Park SR, Kim JH, Jung JH. Selection of proximal fusion level for adult degenerative lumbar scoliosis. Eur Spine J 2013;22:394-401. 23. Polly DW Jr, Hamill CL, Bridwell KH. Debate: to fuse or not to fuse to the sacrum, the fate of the L5-S1 disc. Spine (Phila Pa 1976) 2006;31(19 Suppl): S179-84. 24. Edwards CC 2nd, Bridwell KH, Patel A, et al. Thoracolumbar deformity arthrodesis to L5 in adults: the fate of the L5-S1 disc. Spine (Phila Pa 1976) 2003; 28:2122-31. 25. Cho KJ, Suk SI, Park SR, et al. Arthrodesis to L5 versus S1 in long instrumentation and fusion for degenerative lumbar scoliosis. Eur Spine J 2009;18:531-7. 28. Kim YJ, Bridwell KH, Lenke LG, Rhim S, Cheh G. Sagittal thoracic decompensation following long adult lumbar spinal instrumentation and fusion to L5 or S1: causes, prevalence, and risk factor analysis. Spine (Phila Pa 1976) 2006;31:2359-66. 29. Cho KJ, Suk SI, Park SR, et al. Risk factors of sagittal decompensation after long posterior instrumentation and fusion for degenerative lumbar scoliosis. Spine (Phila Pa 1976) 2010;35:1595-601. 30. Kim YJ, Bridwell KH, Lenke LG, Cho KJ, Edwards CC 2nd, Rinella AS. Pseudarthrosis in adult spinal deformity following multisegmental instrumentationand arthrodesis. J Bone Joint Surg Am 2006;88:721- 8. 31. Emami A, Deviren V, Berven S, Smith JA, Hu SS, Bradford DS. Outcome and complications of long fusions to the sacrum in adult spine deformity: luquegalveston, combined iliac and sacral screws, and sacral fixation. Spine (Phila Pa 1976) 2002;27:776-86. 32. Tsuchiya K, Bridwell KH, Kuklo TR, Lenke LG, Baldus C. Minimum 5-year analysis of L5-S1 fusion using sacropelvic fixation (bilateral S1 and iliac screws) for spinal deformity. Spine (Phila Pa 1976) 2006;31:303-8. How to Cite this Article:Shah K, Kothari M, Nene A. Decision Making in Surgical Management of Degenerative Scoliosis. 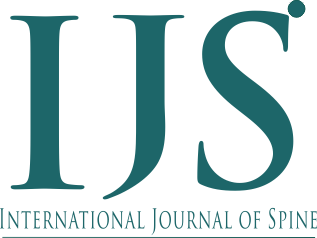 International Journal of Spine Apr – June 2016;1(1):10-14 .